1. RENT TRACHT, the traditional German costume for the fest. 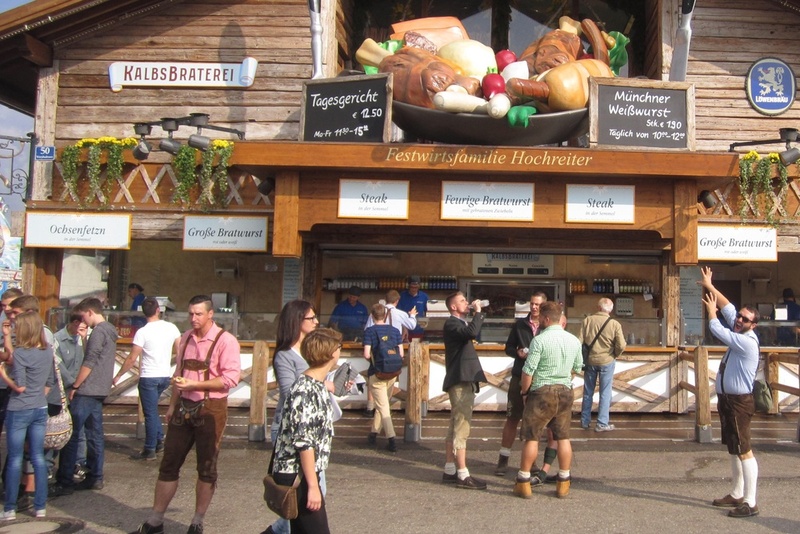 We looked this up on a whim when we rolled into Munich, and it seriously made our experience. All the locals we met were surprised to learn there are rentals out there for both lederhosen sets (including bottoms, tops, shoes and socks) and dirndls (unfortunately, no shoes included), but we discovered Bavarian Outfitters, reserved our sizes on their website and picked up our gear that morning. The rental period is a full day, and you return everything as late as 2p the next day - super score. Our outfits were far more authentic than the sparkly-crap for sale near the Marienplatz (sequined and shiny dirndls above the knee are the furthest thing from traditional and peg you as a total tourist) - and half the price! A full men's getup, head to toe, is 60 Euro; the women's look (apron, dress and shirt) is just 40. 2. THESE THINGS ARE NOT TENTS, they are German-engineered behemoths of temporary celebration. I've built tents; I have no experience with these football-field size hangers with beautiful lighting, full kitchens and the most efficient bathroom setups I've ever seen at any event. The beer tents are absolutely stunning - bright, happy, festive places with elevated bands (albeit mediocre sound systems), tables as far as the eye can see and some of the happiest people I've had the pleasure to imbibe with. 3. IT TAKES MORE THAN ONE DAY TO TRY ALL THE FOOD, and there is so, so much we didn't get to try. I heard rumors of a pastry tent, we gawked at the grilling fish, missed all the pork, didn't make it to the ox and should have started with the giant pretzels - bigger than our heads combined! We missed all of the small tents with our one day visit; We did, though, share one of the most delicious chickens ever to stick to our fingers - this stuff might top broasted for our absolute fave - it was phenomenal. 4. RIDE THE RIDES, though maybe before you've had too many beers. We rode our first rollercoaster together and had a blast. There's a giant swing, some crazy twirling, upside down ride through spraying water, a log flume, bumper cars and so much more - and they're all bigger than standard - kinda like those pretzels I just can't forget. 5. CONSUME 1L WATER FOR EACH 1L BEER. This is a standard rule of drinking, and one the two of us clearly forgot last night. Unless you want to end your night falling, crawling or puking on the curb, seriously consider balancing each beer with an equal amount of water. There was most definitely a point in our singing, swaying and toasting when we had to rely on what little combined wits we had left, say our goodbyes and (very, very slowly and not without conflict and confusion) make our way back out to the edge of town to pass out. It was one of those nights we were surprised we both made it with sunglasses, camera, credit card and a couple bucks in check. Drink the water. Eat the pretzels. We had a blast, and I imagine we'll be back for at least another round. And with this little bit of experience under our skirt, we'll be slightly more sober (at least for a few extra hours), better fed, more prepared for tent hopping and on board for that log flume splashdown. Prost!